A Gmail phishing attack had users fooled for a time this week. The attack revolved around Gmail users receiving an email from a contact who was on their trusted contact list which asked them to open a Google Doc. From there they were asked to give permissions to a fake third-party Google App named "Google Docs". That allowed the hackers to manage the user accounts email as well as manage their contacts. From there they were able to send out more phishing emails to those contacts, so the attack spread quickly. 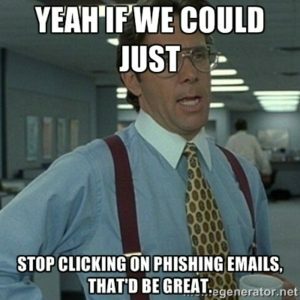 The phishing attack was sent through an email address "hhhhhhhhhhhhhhhh@mailinator.com. using an account from a free email service provider. According to reports over a million users were affected. 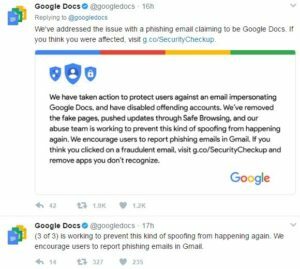 On their Twitter feed https://twitter.com/googledocs the company said steps have been taken to protect Gmail users against the phishing email and have shut down the accounts used to launch the exploit. Google has also said its "abuse team is working to prevent this kind of spoofing from happening again." As in this case...the message contained a strange or mismatched url. The URLs contain a misleading domain name. The messages contain poor grammar and spelling. An offer in the email will appear to be too good to be true. Your employee did not initiate a contact with the person/company you received the email from. The message contained unrealistic threats, mainly around banking and money matters.